Have you been driving around with a dent on your bumper or door and wondered what your options are in getting it repaired? Based on the characteristics of the dent, our technicians will remove it using one of two methods: traditional dent removal, or PDR (paintless dent removal). The traditional dent repair method takes a lot of TLC because it typically requires pulling the dent out, sanding down the area, and painting the damaged area. With specialized tools and a little bit of heat, technicians can restore the bumper or damaged area to its original form. To fix accompanying scratches or paint chips of the damaged area, technicians will sand and smooth down the area. The last step of the traditional repair is to paint the damaged area. Here at Bumper Buddies, we use computer matched PPG paint to ensure 100% color-match. We typically finish traditional dent repairs in about 3-4 hours, depending on the size of the dent. 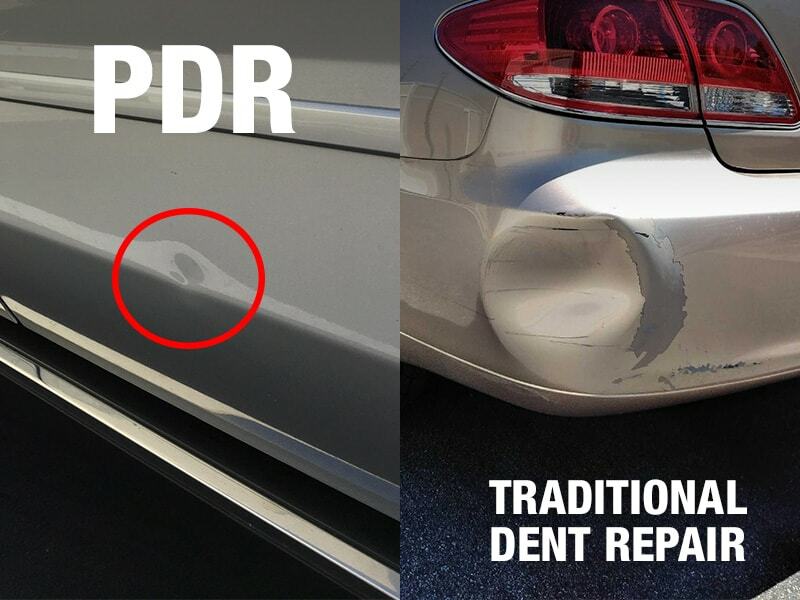 Paintless dent repair, otherwise known as PDR, usually is used for minor dents without paint damage. The process of PDR is very similar to the traditional method, except it requires no sanding or painting. To avoid further paint damage, technicians will typically remove the panels from the car and uses the same special tools to restore the shape. With Bumper Buddies, paintless dent removals can usually be finished within an hour or two, depending on the size of the damage. With 20 years of industry experience, Bumper Buddies are your guys to help repair and remove the dent on your car! Whatever auto body repair you need, we will come to you! Give us a call today at (888) 711-5074 for a free estimate.